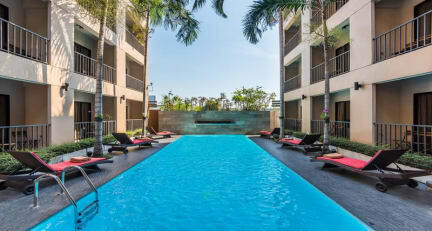 The Cottage Suvarnabhumi offers 102 rooms and 1 Aqua rooms in a two low rise building designed in tropical modern style. All rooms have their own balcony and 6 rooms have their own pool access. The swimming pool is situated in the heart of the land so most of the rooms have the view of the swimming pool and landscaped garden. Our guiding principles are to provide all our customers with excellent products and services by using the most convenient, secure, and efficient way possible. 'For package which include an airport transfer it is very important that you inform us of your arrival flight’s number and arrival time as the airport does not allow hotel staff to standby at the meeting point without guest’s flight detail. "Furthermore, please take note that the hotel offer transfer service only from and to Suvarnabhumi international airport." The staff was so helpful when our tour people did not show. Nice clean rooms. I am still amazed this place is on website - we were not expecting it to be so nice! A very good option if you need to be close to Suvarnabhumi for a flight, and the airport shuttle was super helpful. The pool was lovely, and the room was comfortable and clean. I wouldn't recommend eating in the hostel restaurant as the food wasn't great, and there is a mall with street vendors less than a ten minute walk away. Lovely hotel with amazing pool, cheap food and beautiful rooms. They even had a direct shuttle to the airport for us which was great. Very accommodating staff. Would definitely stay again as it was lovely and a bargain! Not in a great location unless used for proximity to airport. We picked this hotel as we had a relatively early flight from BKK the next day. Our twin room was clean and a good size but the air con took ages to kick in - it hadn't been on prior to our arrival. The balcony overlooking the pool was nice but unfortunately the pool hours didn't suit our visit so we weren't able to use it. The room service menu was extensive and quite reasonable, though we didn't order. The staff organised our taxi and were very helpful with luggage. stayed here one night just to catch a flight out of bangkok the next day. 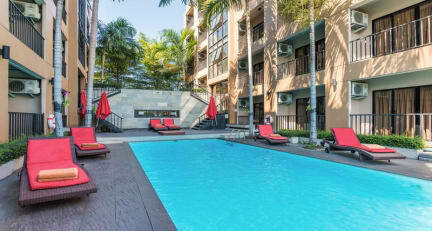 staff were very friendly, rooms were clean, with nice facilities and a good pool area. atmosphere was not great but it was a nice quiet place to catch some rest after long travel days with a short trip back to the airport. would stay again for the same purpose. Location about 15 min from the airport (20 min with traffic). Good shuttle service (cost THB150 two people), it starts around 6:30 am (don't quote me on this), and runs every 30 min or so. We arrived after 10 pm, and left early the next morning. We were only interested in a quick stop before taking the next flight, and it served the purpose. Did not walked the common areas, nor the pool or the restaurant. They offered breakfast but we opted out. The A/C didn't work very well.